Moloka‘i, with the most extensive coral reef in the main Hawaiian Islands, is especially sacred to Hina, the Goddess of the Moon. As Hinaalo, she is the Mother of the Hawaiian people; as Hinapuku‘a, she is the Goddess of Fishermen; and in the form Hina‘opuhalako‘a, she is the Goddess who gave birth to coral, coral reefs, and all spiny marine organisms. Interdependence between the reef’s living resources, the people, and their cosmology was the basis for management of Moloka‘i’s coastal waters for over a thousand years. The ancient residents of Moloka‘i built the greatest concentration of fishponds known anywhere, but their mastery of mariculture, something needed now more than ever, was lost after near genocide from exotic Western diseases. Subsequent destruction of the native vegetation for exotic cattle, goats, pigs, sugar cane, and pineapple caused soil erosion and sedimentation on the reef flat. This masterful volume clearly documents that soil washing into the sea is the major threat to the reef today. Abandoned fishponds, choked with sediment, now act as barriers and mud traps, making damage to corals less than it would otherwise would have been. The role of mud and freshwater from land in preventing coral reef growth, clearly articulated in Charles Darwin’s first book, The Structure and Distribution of Coral Reefs, is the major theme of this book. All around the tropics, coral reefs have died from huge increases in terrestrial sedimentation that resulted from destruction of hillside forests for cash-crop agriculture and pastures in the colonial era, especially in Latin America, Asia, and the islands of the Caribbean and Indo-Pacific. It is obvious that one cannot manage the coastal zone as a unit separate from the watersheds that drain into it. Yet there has been surprisingly little comprehensive scientific study of these impacts. In this landmark volume, U.S. Geological Survey researchers and their colleagues have developed and applied a remarkably integrated approach to the reefs of Moloka‘i, combining geology, oceanography, and biology to provide an in-depth understanding of the processes that have made these reefs grow and that now limit them. They have joined old fashioned natural history of marine animals and plants with study of the geological evolution of the island, hydrology, meteorology, and land-use history, to an arsenal of new methods of remote sensing, including aerial photography, laser ranging, infrared thermal mapping, seismic reflection, in-situ instrumentation to measure chemical parameters of water quality, and direct measurements of the physical driving forces affecting them—such as wave energy, currents, sedimentation, and sediment transport. They provide a level of documentation and insight that has never been available for any reef before. A remarkable feature of this book is that it is aimed at the people of Moloka‘i to inform them of what is happening to their reef and what they might do to preserve their vital resources. The scientific data and interpretations are expressed in unusually clear and comprehensible language, free of the professional jargon that makes most technical publications impenetrable to the public that most needs to know about them, yet without loss of scientific rigor. Here readers will see clearly explained the whole path of soil loss, from the impacts of wild pigs and goats at higher elevations, deforestation of the hills for cattle pasture at lower levels, and denudation of low lands for cash crops. The resulting biological impoverishment has bared the soils, which wash away in flash storms, smothering the inshore reefs, whose growth was already limited because they had grown right up to sea level. The data in this book show that the mud doesn’t get far if it is washed into the sea during a big storm with heavy waves. Afterwards this mud keeps getting stirred up by every succeeding storm, spreading and affecting corals over wider areas until it is finally washed out of the system—and that only happens if there is no more new mud washing onto the reef. I saw this myself a few years ago in Pila‘a Bay on Kaua‘i, where a bulldozed hillside of abandoned sugar cane fields had slumped right on top of a coral reef following exceptional rains. Years later, the algae species were zoned in a way that clearly mapped the distribution of nutrients washed into the bay, most likely from fertilizers bound to the eroded soils. That pattern closely mimics, on a small scale, that shown in Moloka‘i in this volume, where the inner reef is covered with algae, zoned by species in a way that points to land-based sources of nutrients, while the outermost reef slope is still coral dominated, and the deep algae seem to indicate deep-water nutrient upwelling. What of the future? The Hawaiian Islands have been exceptionally fortunate to be spared the worst coral heatstroke death from high temperatures, at least to date. So far, the worst global warming impacts have luckily been small in this region, and the small number of people on Moloka‘i has kept population densities, and sewage pollution, low compared to the more developed islands. Nutrients from years of sugar and pineapple fertilization, and the washing of this soil onto the reefs, show clear influences on the pattern of algae on the reef. Even at very low levels of nutrients, well below that which drives algae to smother and kill coral reefs, more algae is present. Soil erosion control is therefore the key to better management of both nutrients and turbidity on Moloka‘i reefs. To that end land management actions mentioned in this book, such as suppressing wild fires and eliminating wild goats and pigs, could be made even more effective if supplemented by active erosion control using plants whose roots bind the soil effectively in place. Through all of these efforts, Hina and the people of Moloka‘i could be happy again! Download the entire book as a 190-page, 11" x 17" PDF file (sir2007-5101.pdf; 73.9 MB). Note: These individual chapters do not include their references cited as the references for this entire report are bundled together. Therefore link to the references collection is provided in each chapter. The references collection is also linked below. Introduction: The south Moloka‘i Reef: Origin, History and Status, by Michael E. Field, Susan A. Cochran, Joshua B. Logan, and Curt D. Storlazzi (sir2007-5101_intro.pdf; 3.7 MB). Chapter 1: Antecedent Substrate Underlying the South Moloka‘i Fringing Reef and Implications for Reef Development by Walter A. Barnhardt, Eric E. Grossman, and Bruce M. Richmond (sir2007-5101_chapter01.pdf; 1 MB). Chapter 2: Views of the South Moloka‘i Watershed-to-Reef System by Michael E. Field, Joshua B. Logan, Pat S. Chavez Jr., Curt D. Storlazzi, and Susan A. Cochran (sir2007-5101_chapter02.pdf; 8.7 MB). Chapter 3: Shape of the South Moloka‘i Fringing Reef; Trends and Variation by Curt D. Storlazzi, Joshua B. Logan, and Michael E. Field (sir2007-5101_chapter03.pdf; 2.0 MB). Chapter 4: Moloka‘i—Two Different Types of Reef Growth in the Past 8,000 Years by Mary S. Engels and Charles H. Fletcher (sir2007-5101_chapter04.pdf; 1.4 MB). 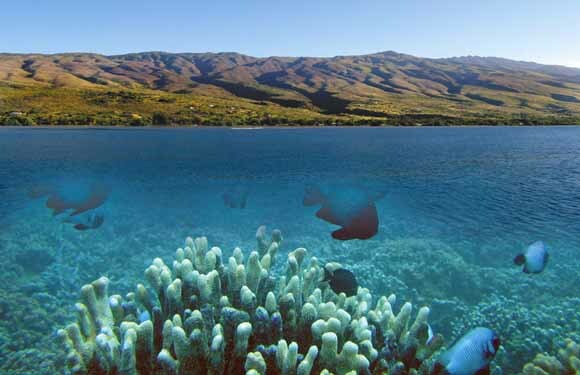 Chapter 5: Reef Corals and the Coral Reefs of South Moloka‘i by Paul L. Jokiel, Eric K. Brown, Ku‘ulei S. Rodgers, and William R. Smith (sir2007-5101_chapter05.pdf; 2.4 MB). Chapter 6: The Status of the Reefs Along South Moloka‘i; Five Years of Monitoring by Eric K. Brown, Paul L. Jokiel, Ku‘ulei S. Rodgers, William R. Smith, and Lucile M. Roberts (sir2007-5101_chapter06.pdf; 1.8 MB). Chapter 7: Coral Reef Fishes and Fisheries of South Moloka‘i by Alan M. Friedlander and Ku‘ulei S. Rodgers (sir2007-5101_chapter07.pdf; 2.4 MB). Chapter 8: The Seaweed and Seagrass Communities of Moloka‘i by Jennifer E. Smith, Heather L. Spalding, Ryan Okano, and Celia M. Smith (sir2007-5101_chapter08.pdf; 4.1 MB). Chapter 9: Benthic Habitat Maps of the South Moloka‘i Coral Reef by Susan A. Cochran (sir2007-5101_chapter09.pdf; 15.6 MB). Chapter 10: Sea Level and its Effects on Reefs in Hawai‘i by Eric E. Grossman (sir2007-5101_chapter10.pdf; 0.7 MB). Chapter 11: Waves and Their Impact on Reef Growth by Curt D. Storlazzi, Michael E. Field, Eric K. Brown, and Paul L. Jokiel (sir2007-5101_chapter11.pdf; 1.4 MB). Chapter 12: The Freshwater Cycle on Moloka‘i by Gordon Tribble and Delwyn S. Oki (sir2007-5101_chapter12.pdf; 0.8 MB). Chapter 13: Ground Water and its Influence on Reef Evolution by Eric E. Grossman, Joshua B. Logan, Joseph H. Street, Adina Paytan, and Pat S. Chavez, Jr. (sir2007-5101_chapter13.pdf; 2.2 MB). Chapter 14: Light, Calcification, and Carbonate Sediment Production on the Moloka‘i Reef Flat by Robert B. Halley and Kimberly K. Yates (sir2007-5101_chapter14.pdf; 1.9 MB). Chapter 15: People, Land, and the Reefs of South Moloka‘i by Lucile M. Roberts and Michael E. Field (sir2007-5101_chapter15.pdf; 2.6 MB). Chapter 16: Invasive Mangroves and Coastal Change on Moloka‘i by Mimi D’Iorio (sir2007-5101_chapter16.pdf; 7.6 MB). Chapter 17: Sediment on the Moloka‘i Reef by Michael E. Field, R. Scott Calhoun, Curt D. Storlazzi, Joshua B. Logan, and Susan A. Cochran (sir2007-5101_chapter17.pdf; 3.4 MB). Chapter 18: Measurement of Toxicity in Reef Sediments by R. Scott Carr and Marion Nipper (sir2007-5101_chapter18.pdf; 1.0 MB). Chapter 19: Sediment Mobility Along Moloka‘i’s Fringing Coral Reef; Evidence From Sediment Traps by Michael H. Bothner, Richard L. Reynolds, Michael A. Casso, Curt D. Storlazzi, and Michael E. Field (sir2007-5101_chapter19.pdf; 1.0 MB). Chapter 20: Causes of Turbidity on the Moloka‘i Reef Flat and Resulting Sediment-Transport Patterns by Andrea S. Ogston, M. Katherine Presto, Curt D. Storlazzi, and Michael E. Field (sir2007-5101_chapter20.pdf; 1.8 MB). Chapter 21: The Effects of a Kona Storm on the Moloka‘i Reef; November and December 2001 by Michael E. Field, Michael E. Bothner, Pat S. Chavez, Jr., Susan A. Cochran, Paul L. Jokiel, Andrea S. Ogston, M. Katherine Presto, and Curt D. Storlazzi (sir2007-5101_chapter21.pdf; 2.5 MB). Summary: The Moloka‘i Coral Reef Today, and Alternatives for the Future by Michael E. Field, Susan A. Cochran, Joshua B. Logan, and Curt D. Storlazzi (sir2007-5101_summary.pdf; 1.1 MB). Download References (sir2007-5101_references.pdf; 0.4 MB). Download the front and back matter. These pages consist of the covers, Contents, Foreword, Preface, Acknowledgments, and Glossaries (Acronyms, Hawaiian Words, and Fieldwork Activities) (sir2007-5101_frontback.pdf; 3.4 MB). For questions about the content of this report, contact Michael Field. Current pricing information is available from http://ask.usgs.gov/to_order.html.